Turnitin is one of the most valued tools for professors, but also the most dreaded one among students. The tool is created with a sole purpose – to help professors detect cheating and plagiarism. And since you often have to use other data to support your essays, you must constantly find your way around the strict detection of Turnitin. To avoid getting a low grade and ruining your academic career because of a software, you must find a way to use data without plagiarizing anything. 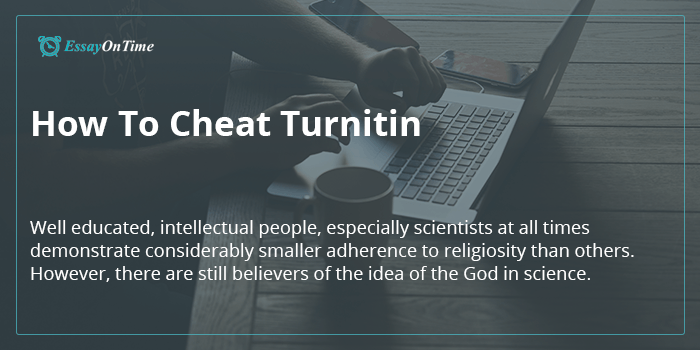 Because of this, students have had to use some very innovative ways that lets them cheat Turnitin. But, as they find new ways to beat the software, professors and the software creators also bypass these cheats and boost the checker. Thankfully, there are still some effective tricks on how to avoid plagiarism in Turnitin successfully. But, before we get into how to plagiarize without getting caught by Turnitin, let’s see what this software does to detect and reduce plagiarism. To learn how to bypass Turnitin, you need to understand how it functions. Turnitin is a program with a large database made of web content, newspaper content, books, journals, and papers written by students and submitted by professors. With the help of a matching-algorithm technology, the software finds strings of words with similarity to the ones found in its database. Basically, when a professor chooses to make a check on your essay, the robots of Turnitin will work their way through every word and sentence you have written to check if they are similar to anything else in the database. So basically, when the teacher uploads your document in the program, the program will take a short while to analyze all the parts of the paper and provide him with all matched parts that are considered plagiarism. This makes it much harder for you to cheat the program, but you still can trick it if you know the following cheats. The cheats that follow on how to trick Turnitin serve to aid you in defeating Turnitin without worrying that you could get caught and put in the category of the ‘bad’ students that plagiarize papers. Paraphrasing is the most effective trick for getting away with copying content when you turn in your paper. If you’re wondering how to make the software see your content as unique, you can find all the answers in paraphrasing. The way Turnitin works allows it to find the similar passages or constructions, but it cannot possibly find the paraphrased content. This will take some of your time away, but if you wish to meet the deadline and defeat the online program, your best approach is to paraphrase the writing. This cheat is not known by many, but students believe that it’s a very effective trick on how to fool Turnitin. If your assignment’s due date is approaching fast and you can’t find enough time to paraphrase everything, you should make a change of format by turning Word assignments into PDF and change the structure accordingly. This way, you’ll trick Turnitin into believing that you wrote everything from scratch and as a result, it will show only original reports to your teachers. This is by far one of the cleverest hacks students have thought of on how to beat Turnitin that students have come up with. After you’re done writing your paper, find a language that contains identically-looking letters to some of the English letters. Replace the letters of English in the assignment with letters from another, similar language. Doing this should do the trick. This is basically rewriting, which is similar and equally time-consuming as paraphrasing. If you don’t like to search for other words to paraphrase your writing, you might like the idea of changing the word order. Once you get the hang of it, it becomes so much easier. It’s also a very effective way to avoid plagiarism and cheat Turnitin. Adding some images, photos, maps, and graphs to the writing doesn’t only make it look more creative and attracts the reader’s attention. This can also save you from the plagiarism checker that is Turnitin. However, from all the tricks in this list, this final one is the least effective because it doesn’t really help you avoid the checker when it comes to the actual, plain content. It will only work if you use a lot of pictures and graphs to fill in the space, but write only original content in the space that’s left. Thanks to this list, you now have some great ways to cheat one of the most widely used plagiarism checkers by teachers online. Of course, the best idea is to write original papers whenever you get such an assignment. But, due to the many obligations most students have, this is often an impossible thing to accomplish within a given deadline. We don’t recommend that you always resort to these methods but, when you have no other way out, these can come very handy.